Complete with a fun little video too. It was kind of a spur of the moment thing. Please excuse the odd music and not so perfectness of this whole video idea. 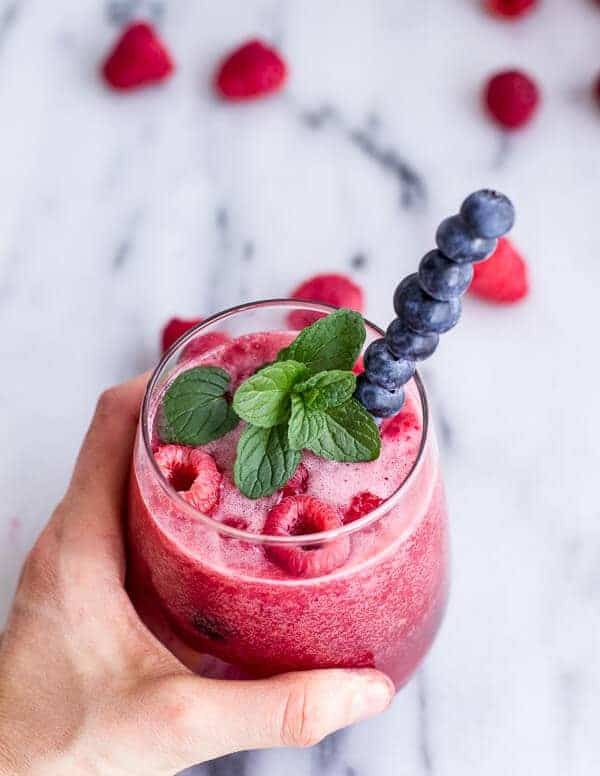 Raspberry-Rhubarb Bellini Smoothie w/ Blueberries (Virgin…or not so Virgin) from Half Baked Harvest on Vimeo. Alright, but here is thing, I am turning over a new leaf. Before a few days ago, I kind of thought drinks where a little lame. Maybe it’s because I do not actually drink alcohol straight up (I prefer it in my chocolate or even in my tacos) or maybe it is because I was just never introduced to these fruity drinks. Growing up I was mostly a water drinker. Well actually, a sparkling water drinker. There is this grocery store back in Ohio called Marc’s and it carried some of the cheapest, best tasting, sparkling water around, Mendota Springs. I swear it’s was Ohio’s best kept little secret because it was so good. The carbonation was insanely intense. The most awesome part was that it really was just carbonated water, nothing else. No sugar and no weird ingredients. Marc’s is a store for people who want to shop CHEAP. It’s not anything like Whole Foods (just opened up here last week! ), Heinen’s, Giant Eagle, Safeway, Von’s, Fred Meyers, Albertson’s, City Market (my usual store – also called King Sooper’s in Denver), Publix, Piggly Wiggly, Ralph’s (could I possibly have missed any?) or any other normal grocery store. Really, it is just kind of something you have to see. Some people are down right disgusted by Marc’s and will not even set foot in the store. Personally, I miss Marc’s. I am pretty sure it’s an Ohio only store, but every time we visit we always hit up Marc’s. FYI, if you are in the area they have the best produce around. Nothing beats it if you ask me. Anyway, sparkling water was my drink. I was never a soda girl, all though I did love lemonade, but what kid in their right mind doesn’t? As for the rest of my family, my brothers drank a little pop (soda) here and there, but nothing too exciting. Mom and dad have always been beer drinkers, nothing mixed other than the occasional margarita for my mom. So pretty boring. The other day though, I got the urge to create a drink. I am pretty sure it was because of all the berries on sale in the store. Basically berries just make me happy, and apparently they bring on fun ideas too because I have way too many fruity things heading your way the next month. 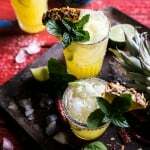 I am going heavy on the tropical flavors because little old me will soon be breaking out of Summit County and heading to Florida in June for a girl’s trip with my grandma. So now, all my mind can think of is fun, colorful foods. 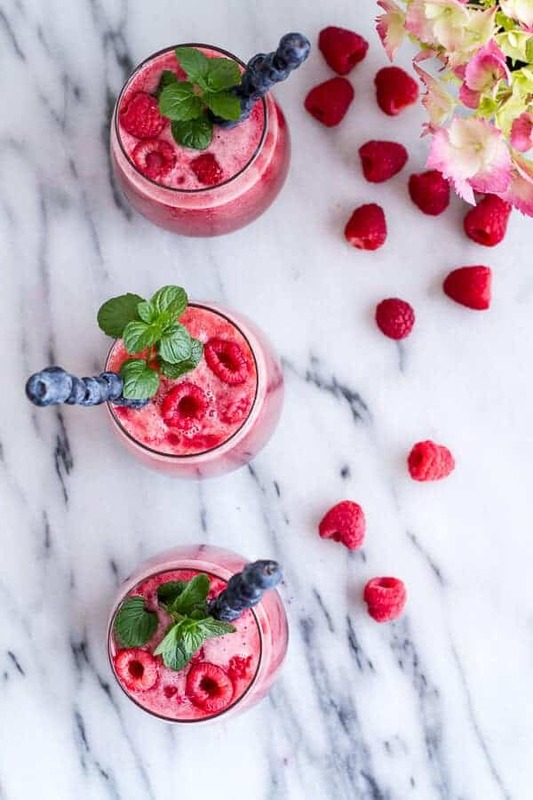 So these drinks, or smoothies, or whatever you’re calling them, are super easy, super fruity and perfect for Mother’s Day brunch. Which is kind of the idea I had going with all the colors. You know, it is funny because I have so much fun creating foods for certain holidays and celebrations, but the thing about my family is that since we moved to Colorado we almost never really celebrate anything other than Thanksgiving, Christmas and Easter. Although, Easter this year was pretty pathetic since half the family was MIA. Oh well, oh well, guess I’ll just have to celebrate holidays my own way. For the drinkers in my family I added the booze, and for me I kept it virgin. Tried both versions and both are extra delicious. If for no other reason, make them just to stare at them. I mean, could a drink be any prettier? I got exited just looking at these. 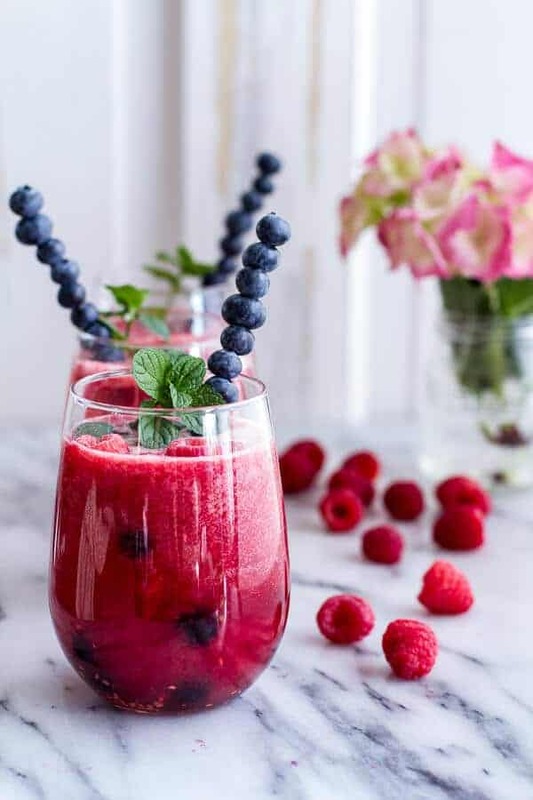 Raspberry-Rhubarb Bellini Smoothie with Blueberries (Virgin...or not so Virgin). 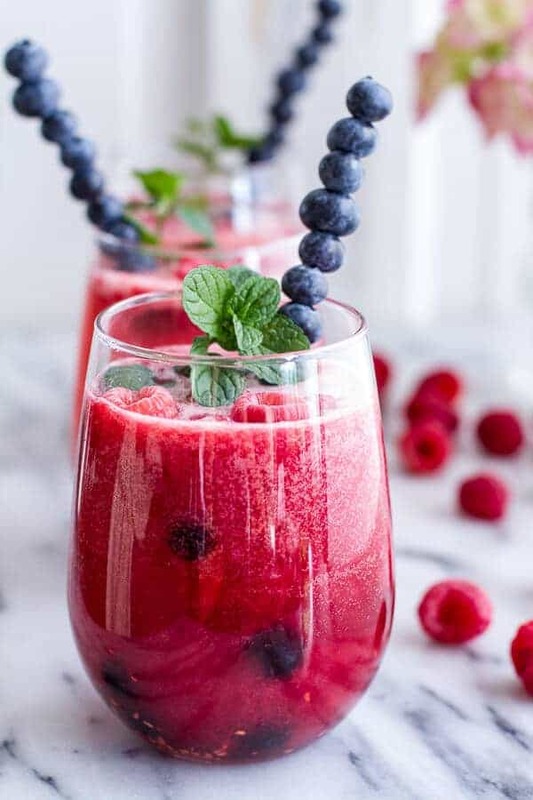 So these drinks, or smoothies, or whatever you're calling them, are super easy, super fruity and perfect for Mother's Day brunch. Which is kind of the idea I had going with all the colors. Combine the rhubarb, sugar and water in a medium saucepan. Bring to a boil over medium-high heat and cook, stirring occasionally, until the rhubarb breaks down, about 10 minutes. Remove from the heat, add the mint and let sit 1 minute, then strain the mixture through a fine mesh strainer. The mixture should be syrupy. If it's too watery, return to the pot and continue cooking until the mixture is slightly reduced. Cover and refrigerate until cold, about 1 hour. Skewer the fresh blueberries on wood skewers. 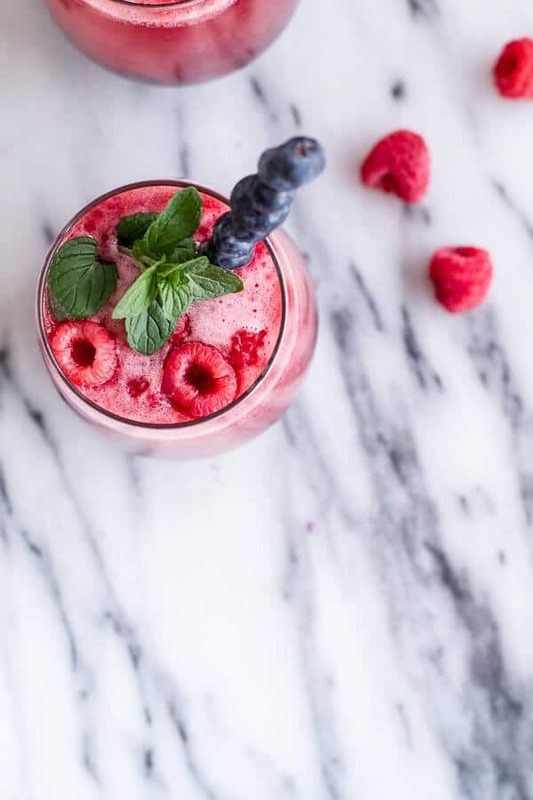 Add 12 ounces fresh raspberries and 1/3 cup of the rhubarb simple syrup to a blender and blend until completely smooth. Divide the frozen blueberries among 3-4 glasses. 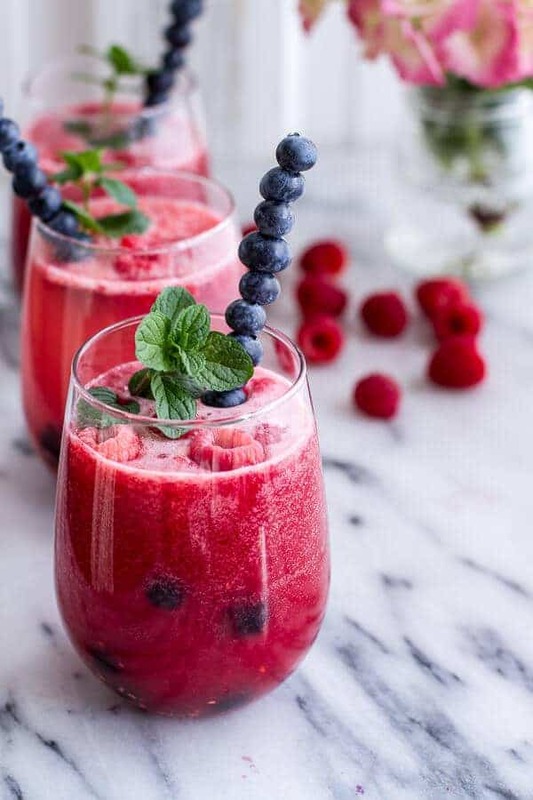 Divide the blended raspberry-rhubarb mixture among each glass. Pour the sparkling water, Prosecco, or other sparkling wine into each glass. Add your blueberry stick and swirl to mix. 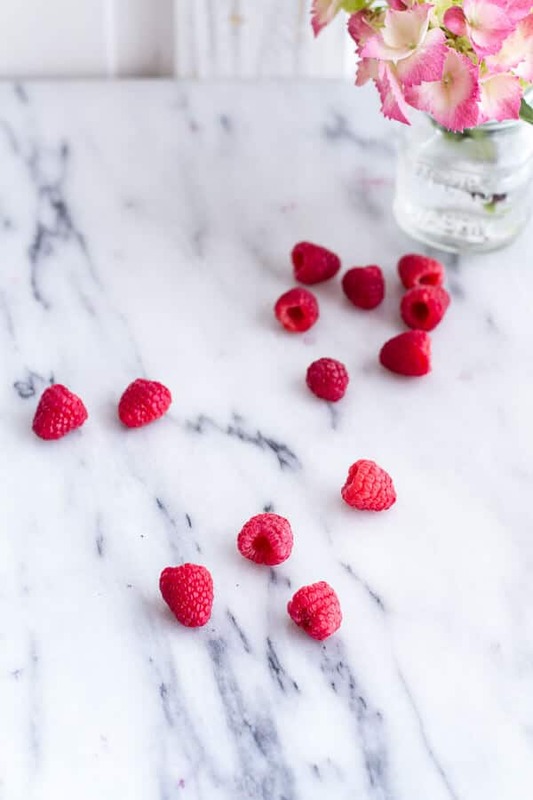 Garnish with a few fresh raspberries and a sprig of mint. Drink! But don’t just stare. No, no, no, no, no (as Asher would say), they are just too delicious for that. Oh my, you should definitely make drinks more often, because these look amazing. And the video is super cute. For the drinkers, I think these would also be great with a little gin and club soda. Thanks Matilda!! The gin sounds awesome! I love so many things here. One that you called it “pop!” I didn’t know Americans knew that word – that’s what I call soda! 2. Bellinis are my absolute fav? And in a smoothie! I’m all for Tuesday drinks! These are GORG girl! Pinned! I love how vibrant the colors are! Soooo so gorgeous! And those little blueberry skewers are so freakin’ adorable! Thanks so much!! I love the color too! BEAUTIFUL!! And for real girl – you need to stop apologizing for the “not so perfect”ness of your videos because I think they’re perfect in every way. Seriously love them! Thanks!! Rhubarb lemonade is so good bye the way! How incredible are these!! These could become a ritual for me! What seriously beautiful drinks! I LOVE that vibrant deep fuchsia!! Sounds like a perfect drink with the right amount of fizz! Love the video! 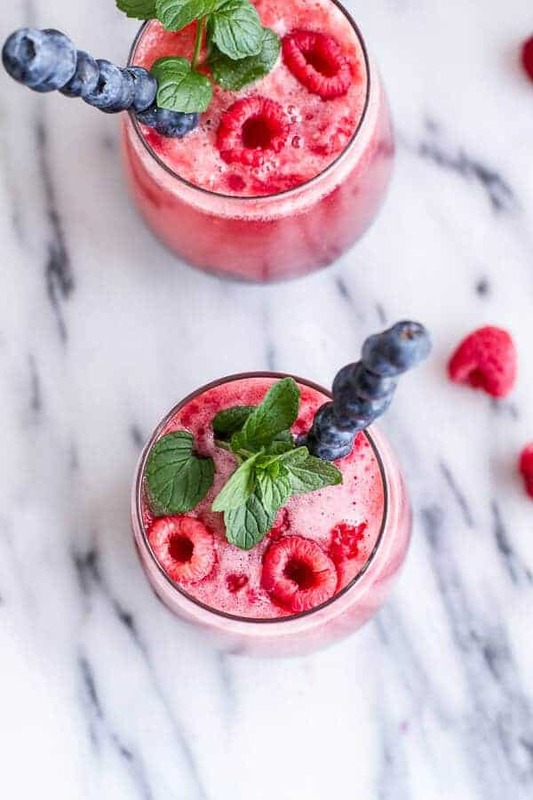 And I love all the berry-liciousness going on in these drinks! Thanks!! 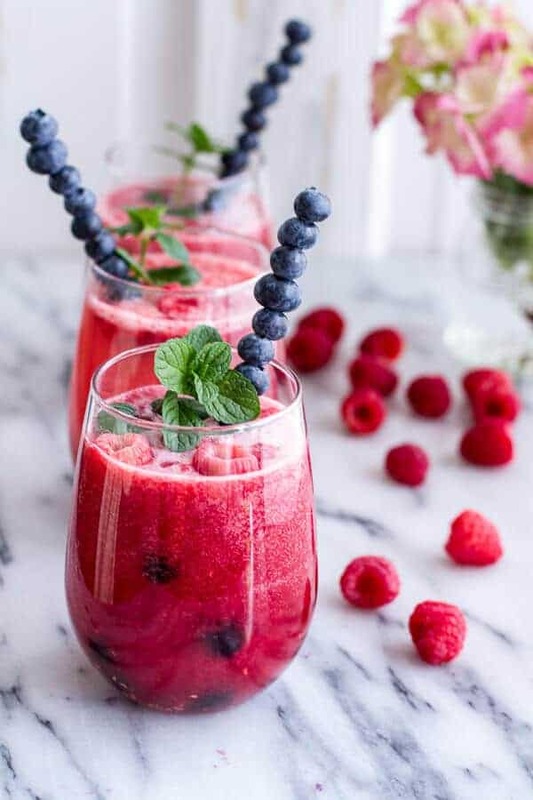 I am all about the berries right now! The color of this drink is just BEAUTIFUL! 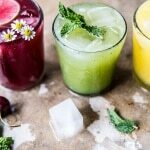 These drinks are gorgeous! How cute are your hands?! Not gonna lie, I’d de-virginize the crap out of these! Ha! My hand look SO Pale!! That color is so pretty, love these for brunch! wow Tieghan I love the video! 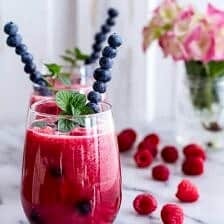 It is so fun and drink looks so delicious! Thank you! Happy you like the video! Tieghan, I love the video! And, I love that you’re a sparkling water/club soda kinda girl. Me too! I’ve never been a huge fan of anything other than water but I love a little carbonation of sparkling water! 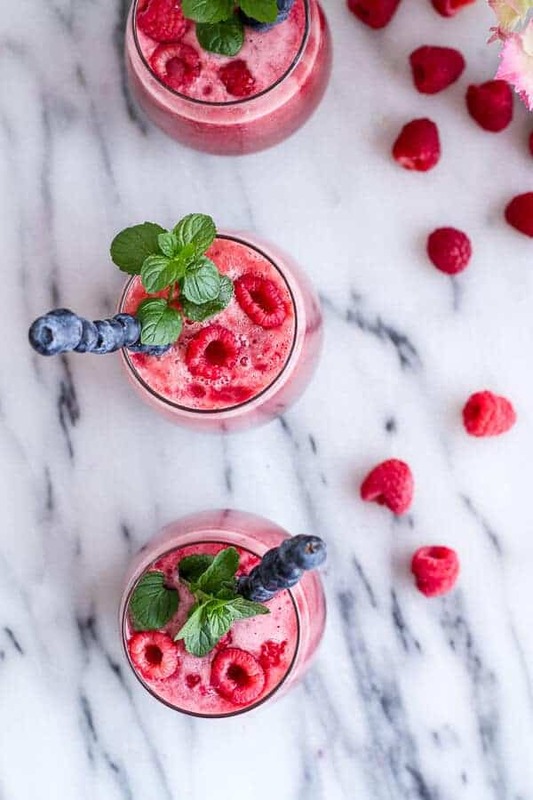 And these smoothies are gorg! Girl, that video is perfection…no apologies! 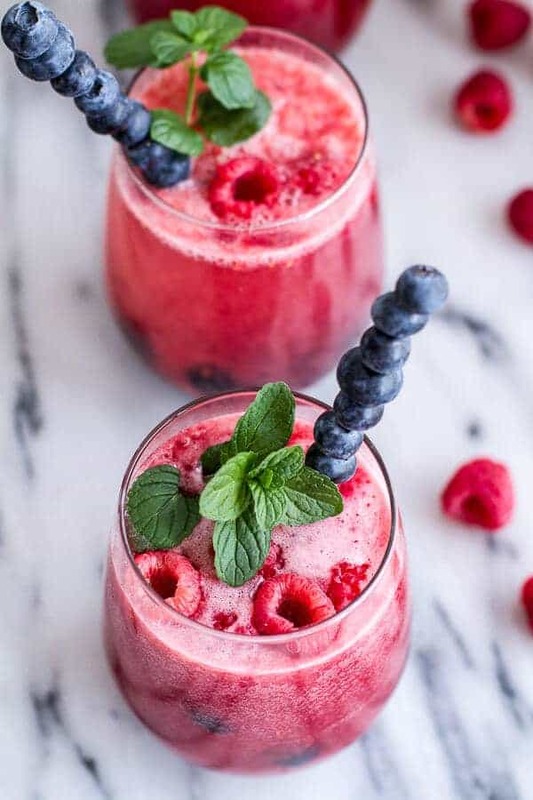 These look so delicious and refreshing! p.s I love that you call it pop because that’s what we call it in Canada! Thanks Jessica! I seem to go back and fourth with pop and soda. Not sure which one I like better. 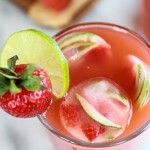 This is one gorgeous & refreshing drink! Gah! Those blueberry straws are too stinking cute!! Loving this drink! LOVE the video, Tieghan, great drink, too. Have fun on your Florida trip! It will be nice and warm/HOT here in June! Thanks Julie! I am so exited! Beautiful! Love those blueberry skewers! Such a cute idea–and the video is awesome. I was a huge sparkling water girl growing up too! I would put as much lemon or lime into as humanly possible. Haha! Sparkling water + lemons or limes is SO good. I need to do it more! 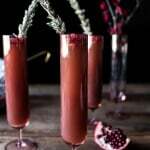 These are definitely a cocktail I can get down with, without alcohol or with. I actually have just started getting into sparkling water, and I have to say, I’m kind of addicted. It’s hard for me to drink regular tap water now! Sparkling water is so addicting! These are absolutely gorgeous. I love how bright and colorful, and I just made rhubarb simple syrup, so clearly I’m all set for them to be mine. This looks insanely good! And I love your video! Haha! Thanks so much! Hope you love these! 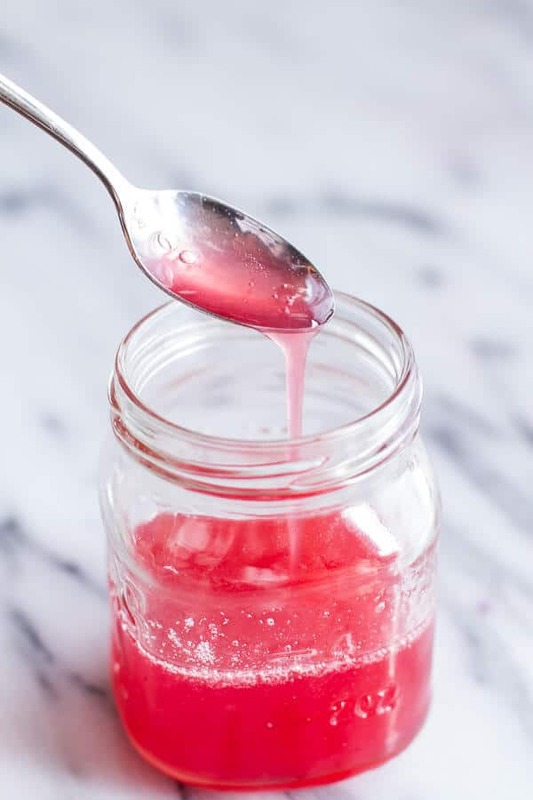 Just to tell you that your recipe is so amazing that i put it on my blog today, a little bit different but as good as yours ^^ Great idea this rhubarb syrup, we like it so much 😉 thank you for that ! Wow!! So awesome!! Thank you so much!! I will go check it out!! Ditto on the comments about the great pics. The blueberries on the straw is a great idea. I need to eat more rhubard, such an amazing food for health (but messy to work with). Thanks so much Anna! Rhubarb is a mess but your so right about it being good for you!